Of the five states described as ‘least developed’ by the Report of the Raghuram Rajan Committee on Evolving a Composite Developmental Index four have a considerably large scheduled tribe population. It is also significant that all these states boast a robust annual growth rate and have pursued aggressive policies which have resulted in the changing class differentiation within tribal people. This differentiation is also a result of the forms of adverse integration of tribal workers into rural and urban labour markets. The increasing labour mobility amongst the scheduled tribe population is reflected in the growing trends of urbanisation and changing intensity of dispossession amongst tribal people. The root cause of these changing patterns of mobility and rising inequities within tribal communities is the continuing structural changes in the agrarian economy, both interms of the consolidation of land holdings and the penetration of big capital into export led commercial agriculture. This is particularly true of states like Chhattisgarh and Madhya Pradesh where contract and corporate farming in tribal lands has been a result of sustained policy initiatives that are consistently linking tribal farmers and rural farmers to national and global markets. Third party industry agreements in joint forest management projects (in states like Andhra) and the promotion of export and industry oriented agricultural produce like safed musli (for example in Bastar, Chhattigarh), soya bean (through the ITC in Madhya Pradesh) and floriculture in large parts of Chhattisgarh has fundamentally changed the agrarian relations within the tribal regions. This article shows that it has also led to growing inequities within the tribal society as revealed in the available sources of data for the scheduled tribes. This table shows that the decedal increase in landlessness amongst the scheduled tribes has been the highest in Madhya Pradesh in the period between 2000-2011. While the increase in landlessness is lower than the all India average in all states except Jharkhand percentage of marginal holdings below 1 hectare has registered a significant rise in all the four states. This clearly indicates that medium size land holdings are getting fragmented but the loss of land amongst the adivasis may not be absolute in its character. This means that those with larger land holdings are loosing a significant part of their land but not all their land so as to be classed as ‘landless’. Chhattisgarh is especially significant in this regard since there seems to be an unusual increase in medium adivasi land holders, a phenomena that has possibly arisen out of the Chhattisgarh governments contract farming initiative where adivasi peasants are directly linked to corporate houses. This rise in marginal and medium land holdings at the same time indicates a fundamental change within the class structure of the Chhattisgarh adivasis and can explain the spurt in urban growth rates of adivasis in the state. The secular rise in marginal land holdings has to be seen as a part of the larger proletarianisation of the tribal people. It is even more interesting to note that the rate of decline of large and medium land holdings within scheduled tribes is considerably less than that of small and marginal holdings. At an all India level, the picture emerges in a more complex form. The rate of decline of large land holdings is much slower than marginal and sub-marginal holdings. This indicates that the tribal people with larger land holdings are able to retain their ownership where as the marginal farmers were becoming dispossessed, increasing the inequities between the landholders and the landless tribal workers. Of the four least developed states, Jharkhand, Chhattisgarh and Madhya Pradesh have a poor record in the settlement of claims under the Forest Rights Act. Chhattisgarh and Madhya Pradesh also have the highest rate of diversion of forest lands for non-forestry purposes. Most of this diversion is for the purposes of private mining projects which have a big impact in the displacement of tribal livelihoods. This is clearly seen in the decedal changes in land ownership as shown previously. In fact, in Madhya Pradesh landlessness has increased by 23.1 percent in the decade of 2000-2011, and in Chhattisgarh by 8.2 percent between 2005 and 2011. This clearly indicates that the class position of the adivasi as a rural worker rather than as a peasant has been further reinforced ever since the post-economic reform period. But today, most adivasis are unable to find gainful employment opportunities in agriculture. Such a conclusion is only reinforced by the Census data of 2011. The table above shows a secular decline in the number of main workers or workers getting more than 180 day of regular work in one year, even though there is only a marginal decline or increase in the total work participation rates. What is more interesting to note is the fact that this decline is more drastic in the rural regions of all regions except Madhya Pradesh whose decline in the main rural workforce is lower than that of the all India workforce. This figure becomes especially significant when we consider the fact that the main work participation rate of women has increased in the state. This is in stark contrast to the decline in the work participation rates of the marginal female workforce in the state in the same period. But overall the secular increase in marginal tribal rural workforce (that people working for less than six months a year) is reflective of the larger rural crisis that has fundamentally impacted tribal livelihoods. In contrast there is a generalised increase in the main female urban workforce in all cases except for Chhattisgarh, and the decline in the urban male workforce in the same period highlights the gendered nature of the changes in the occupational structure. Further even though there is a general all India increase in the total work participation rate for scheduled tribes it is largely a result of the increasing rates of marginal rural and urban work. But even here, the rate of increase in total and rural female marginal work is higher than that of males. Significantly the decline in female marginal workers in the urban areas is replaced by a corresponding increase in the main female urban workers. Once again this indicates that schedule tribe women are shouldering greater responsibility to meet the daily needs of urban survival. In this context a further probe into the nature of occupational changes reveals a rather interesting scenario of working class formation and consolidation amongst the scheduled tribes. The decedal changes in the industrial classification of main workers reflect the land dispossession that is taking place amongst the tribals. Given the figures for increasing landlessness amongst the tribal people, it is not surprising that the number of tribal cultivators or peasants have declined by more than 10 percent in all least developed states except for Odisha where the rate of decline is less than the all India average of 10.31 percent. As expected most of this decline is amongst the tribal farmers of rural areas, but this decrease is also gendered in its character. 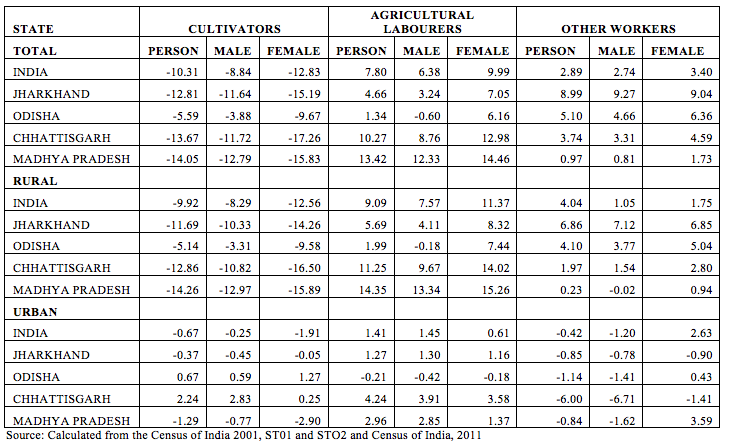 The rate of decline in female cultivators is higher than that of male cultivators in the rural regions indicating that female farmers and female headed households face a greater degree of vulnerability. An interesting aspect of changes in work patterns relate to the category of ‘other workers’. Here to the rate of increase in female work participation rate is higher than that of males. Significantly that though there is a secular decline in the category of “other workers” in urban areas, the female urban work participation rates in this period seem to be increasing at an all India level and at least in two of the four least developed states. In states like Odisha the rate of its decline is small and much lower than the rate of decline of male work participation. This leads us to the conclusion that more women are being forced into the non-agricultural workforce as far as regular work is concerned. This picture contrasts with the decedal changes in the character of marginal work. 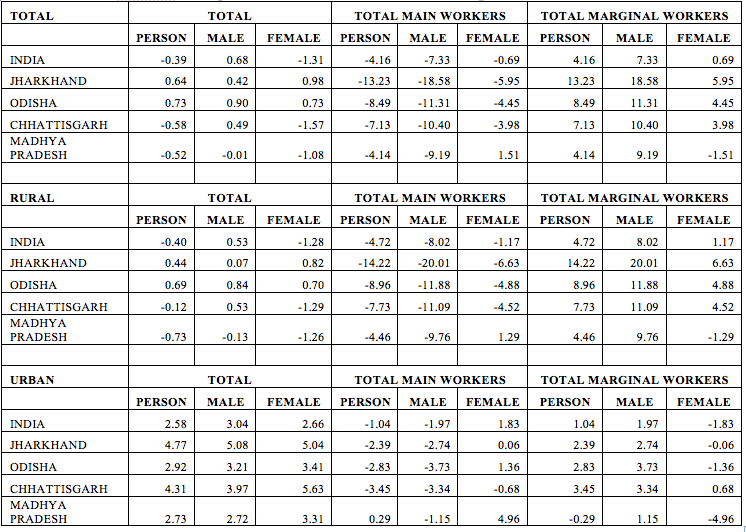 The data shows that though the number of tribal marginal other workers have gone up in both urban and rural areas (Table 3) the increase is much higher in the case of male worker participation rates (7.33 percent) as compared with female marginal work participation rates (0.69 percent). The pattern of this trend is more evident in the rural areas where work participation rates of marginal work have increased by 4.02 percent overall and for male workers they have risen by 8.2 percent in rural and 1.97 percent in urban areas. In the four states under consideration the rural marginal work for male workers has risen by almost 20 percent in Jharkhand and more than 10 percent in Odisha and Chhattisgarh. In Madhya Pradesh it has risen close to 10 percent, a figure higher than the all India average. Almost all this increase is in category of ‘other workers’ in the case of Odisha and Jharkhand and agricultural labour in the case of Chhattisgarh and Madhya Pradesh. The facts presented above reveals the different methods of the integration of the ‘tribal worker’ into labour markets and the economy at large. In the case of states like Odisha and Jharkhand the sharp rise in the male and female rural ‘other workers’ is more a result of private mining and construction works in legally demarcated rural areas. But the changing economic geography of these regions indicates the development of a peri-urban workforce especially with the setting up of industrial townships with the help of private corporate capital. In case of Chhattisgarh and Madhya Pradesh the consolidation of land holdings under the control of relatively large farmers is inspired by a governmental push towards contract farming and export led agriculture through corporate support. Further the data also supports the argument that the rate of increase of the entry of female tribal workers into the regular labour market is higher than that of the tribal male workers in most cases. This clearly shows that the work patterns within the scheduled tribes are emerging largely in contrast to the general decline in the female workforce participation within the Indian labour market. In all cases however, it is clear that the status of the scheduled tribe is getting consolidated as a rural and urban worker and not as a farmer. 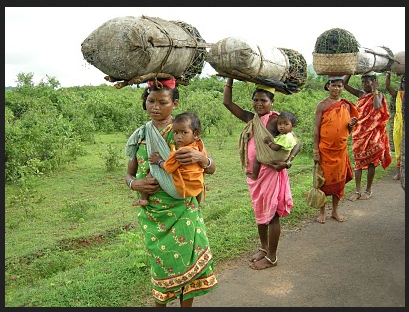 In this situation the slow implementation of the Unorganised Sector Workers Social Security Act, 2008 and Forest Rights Act, 2006 will only further hurt the interests of the scheduled tribes in contemporary India.